I am not sure about you, but I have a ton of basil in my garden still. We have been giving it to our family and friends. Last week I made these amazing little lemon cupcakes with a lemon curd bottom. They are great as is, but I wanted something more. I used some of that extra basil that I have and made a delicious glaze. The combination works well. 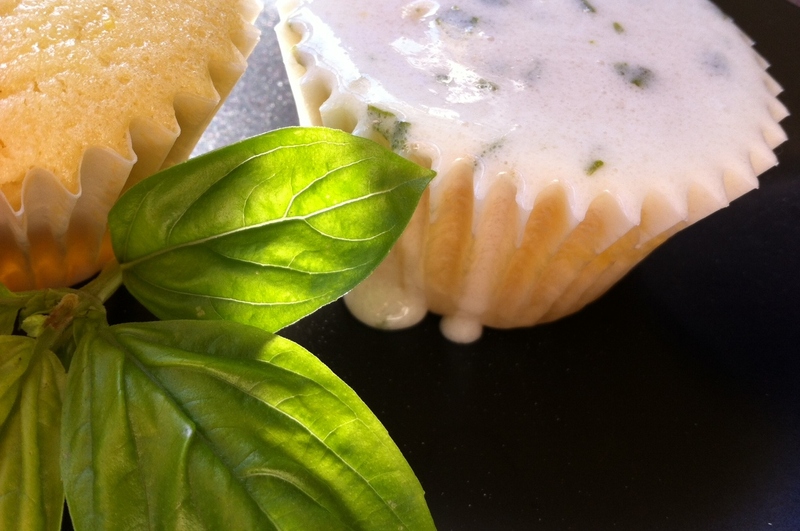 If you’re a fan of lemon and basil this is a must try recipe. You will not be disappointed. Lemon and Basil don’t have to just be a summer fling. Enjoy!!! Sift together flour, salt and baking powder. Then whisk together and place to the side. With an electric mixer in a medium bowl mix butter and sugar together until creamy and smooth. Add eggs one at a time to the sugar mix. Mix Until well incorporated and remember to scrape from the sides with a spatula. Add zest and vanilla. Continue to mix. Now add lemon juice and almond milk. Pour in half of the flour and mix then add the rest and mix. Once that is done using an ice cream scooper fill your cupcake tins about 3 quarters of the way. Bake for about 20 to 25 minutes remembering to rotate half way through. Then place on cooling rack or on counter. I love lemon and basil. They make a lovely combination. I always end up killing my basil plant.. any tips on how you keep yours thriving? Place the basil plant in a location that gets at least six to eight hours of sun a day. If the plant is indoors, an east-facing window is ideal. Make sure it is not in a draft. Basil loves to be warm. Water basil at the base of the plant, and try not to get the leaves or the stems wet. Let the soil dry out a little in between waterings. If growing basil indoors, add fertilizer monthly. Do not over-water. Prune your plant by pinching off individual leaves, or the whole top of the plant with your fingernails, when the plant is about 6 inches tall and has at least three to four sets of leaves. If you don’t prune, or harvest regularly your basil will bolt to seed. Transfer your basil indoors before the first fall frost to prolong the life of your plant. YUM! I wish I could reach into my screen and pull one of these right out! I tonnes of basil left…great suggestion. Thank you!